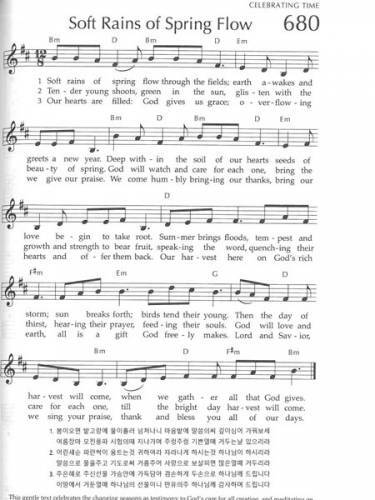 Huh, associate for Korean translation at the Presbyterian Center in Louisville, said the church where he worships, Harvey Browne Presbyterian Church in Louisville, planned to sing “Soft Rains of Spring Flow,” Number 680 in the hymnal, at precisely 5:58 p.m. Eastern Time — the first minute of spring — as part of its regular Wednesday night dinner program. As it turns out, there’s a story behind the hymn, Huh said. Alfred Fedek, who chaired the tune committee for the hymnal, added harmonization for the accompaniment. “It was truly a collaborative work that happened in the Presbyterian Center chapel and conference room where the committee met,” Huh said. Additional collaboration took place everywhere from homes to airport waiting areas, he said. The text, Huh noted, is by a Jong Rack Im, a Korean Methodist pastor and superintendent, who pastored a rural church (Kyosan Church on Kangwha Island in South Korea). The church faced the border with North Korea.